So autumn is definitely here. Last night by the time we’d finished dinner and cleared away it was dark already, and the rain looks set be spending the whole weekend with us. This calls for a switch to more autumnal drinking, so a Malbec that’s been sitting in the rack since spring was called into action. 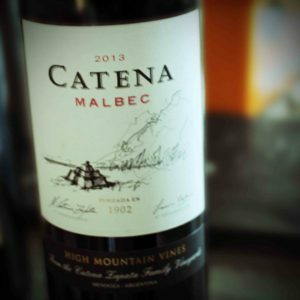 Catena Malbec ’13 is a beautiful dark purple colour, almost opaque. It smelled of cherries and dark fruits, but with a bit of Parmaviolets too. I suspect it’s really a bit of violet, but I don’t recall ever having smelled an actual violet, and Parmaviolets were always included in a Lucky Bag. I’ll admit, the were the sweet I’d leave til last or offer to someone who wanted to partake of may lucky bag hall. In wine it’s not such a bad thing though. It’s dry with quite a bright, mineral acidity. The tannins are mostly soft with a bit of firmness. It was medium bodied, with an alcohol level just pushing above medium, giving an overall smoothness. The flavour focused on black cherry, ripe plums and bit of more cooked cherry pie filling, with just a hint of spice and a bit of minerally-ness that bordered on the dirt, but again, not in a bad way. The violet smell gave way to a bit more of a herby taste, almost. but not quite, entirely unlike the sort you get from Provence. I looked up where I’d got this from and it was a Waitrose purchase, but it looks like they’ve moved on to the 2014 vintage now. I’ll give that a go, as I did enjoy this one. It’s no delicate little small vineyard wine, this is big production wine, so I suspect they’ll work quite hard to blend a wine that doesn’t vary massively from vintage to vintage. Right now it’s £13 a bottle for the 2014, but if you’re in the US you can get the ’13 for $18 from Wine.com if they ship to your state (don’t get me started on the criminal cartels of US alcohol laws).